Watching Adrian is always fun. Seems like a genuinely nice guy too. Nice studio. He has two RS-200 sequencers for the Analogue Systems modular. I have merely one. Don't forget this one for all your hipster/loop-pedal fun times. 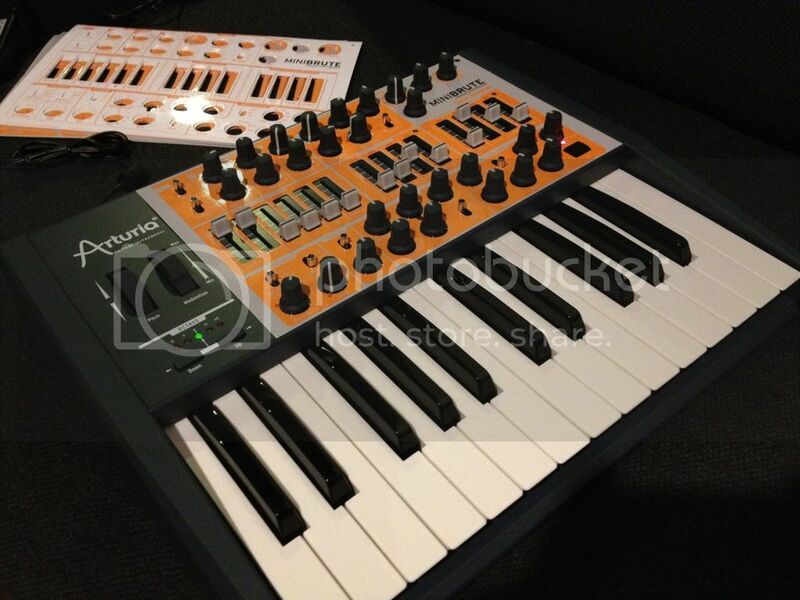 Somehow, I got lucky and scored a Minibrute from a Guitar Center in Pomona, CA. As you all know... or, for those that are waiting to pick one up still, the synths' build and tone are outstanding! Here's a minute and a half of some sounds I put together and the only effects are a little reverb and delay. One part was multi-tracked but only two notes are layered in that part. I can't believe how big it sounds! I pumped a drum loop from my micro X into the Minibrute and modulated the filter with the LFO - synched to Ableton Live. Have a listen. Mine finally showed up. Off to pick it up. Pretty stoked! W00t just hopped on the bandwagon-- after having no luck scouring shops all over Germany I found one without expecting it on my way home. The whole trip there was no minibrute in sight, but this morning we were off to the airport heading back to Canada when stepping out of the hotel we noticed some music store just across the street... walked downstairs and there it was, first thing I saw! Didn't even think twice, now it is mine ALL MINE! They're popping up in various places now - looks like the production is picking up. Got my replacement last week. (First one had a bum pot.) This little thing really is an excellent t addition to almost any studio--simple to use but rich in sounds, small enough to tuck away or bring as an extra to gigs, integrates easily with CV, etc. Plus those patch sheets are just so damn adorable! GuyaGuy wrote: Got my replacement last week. (First one had a bum pot.) This little thing really is an excellent t addition to almost any studio--simple to use but rich in sounds, small enough to tuck away or bring as an extra to gigs, integrates easily with CV, etc. Plus those patch sheets are just so damn adorable! The new factories makes me wonder if the newer Minibrutes will have less defects. Also, I just jumped back in the preorder line. Now that people actually have their MBs, shall we talk about how we are using them rather than how mean Arturia is for making people wait? No we don't. Not in Europe. I'm still watching the site getting the "unconfirmed" date pushed back a few more days every day it hits. Called the shop the other day, he STILL didn't know anything at all and was quite annoyed with the whole synth, but since many ppl are waiting, he'd call the importer and get some answers and post a new date on the site if possible..then it was "unconfirmed 11th october". So, yeah..
Alright, I guess it's back to another 50 pages of complaining. And GO!